Let’s face it — special event invitations (such as wedding invitations) are some of the most important pieces of mail you will ever send. Which is exactly why people employ the skills and talents of calligraphers to make said envelopes look sooooo amazing. Hiring a calligrapher is well worth the price, but there are certain things you should know and think about before hiring one. So from a professional calligrapher directly to you, here are a few items you should know and consider. Typically a calligrapher is a one-person operation. Meaning if you find one and really love their style, there is only one of that person who can calligraph your envelope or project in that style. So book them early. As early as six or seven months. You don’t even have to know all the details of what you want. Most calligraphers will accept a deposit to reserve time on their calendar. Not only will you be assured of your place on their schedule, you can avoid additional fees such as rush fees or convenience fees for waiting until the last minute — that’s if you are lucky enough to find a calligrapher that is not booked up. Don’t be afraid to ask questions. Many brides feel like they have “stupid” questions regarding how to address envelopes and proper etiquette. We do this for you and love helping you! Envelope etiquette can also be tricky, so trust me, your questions are not stupid! Don’t be afraid to ask questions on etiquette, resources to help you prepare your list, make decisions on addressing and other questions regarding your project. Its important to figure out how your want your envelopes to be addressed, especially for number three on our list. 3. Thoroughly review your guest list!! I see this one a lot. Check your list three times to make sure all everything on it is correct. Then check it once more. Are all your guests included? Is everything spelled correctly? What about streets and states — abbreviated or spelled out? Providing an accurate guest list to your calligrapher allows the entire process to go more smoothly. They can focus on beautifully addressing your envelopes instead of contacting you to clarify things on your list. If you have a last minute addition to your list, don’t fret! Reach out as soon as possible to let them know and they will let you know how to provide them with that information, whether through email, or submitting and updated list, or some other method of their choice. Calligraphers are human too and make mistakes. So for this reason, pretty much all calligraphers require your provide extra envelopes — usually 15%. So when ordering your invitations, don’t forget to purchase extra envelopes as well. Your calligrapher undoubtedly took plenty of care making sure they addressed everything correctly based on what your provided on your list. That being said, you should still proof your envelopes shortly after you get them back (within 1-3 days) to make sure there are no corrections to be made. If there are corrections that need to be made, reach out to your calligrapher as soon as possible so they can re-write what needs to be corrected and get it back to you. Because of this, you should allow extra time for these possible corrections before your mail date. You should always check with your calligrapher for their specific policies and procedures. Being prepared and having open communication with your calligrapher will only help the process go that much more smoothly! If you are interested in Honeybee Paper Co.’s calligraphy services, check out the calligraphy page for more information and to book time! For more details on the timeline for sending your wedding invitations, check the When To Send post! 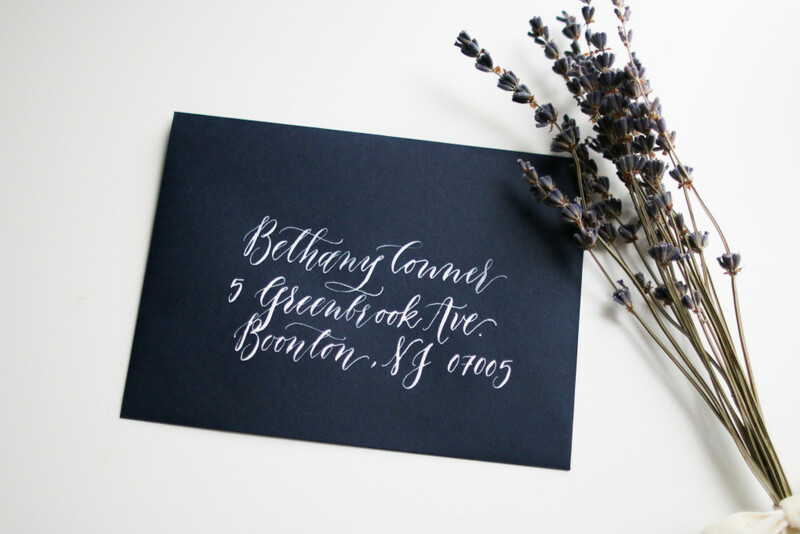 All calligraphy and photography by Megan Veliz of Honeybee Paper Co.